It’s Karen Stivali here for one last time this evening. I’d hoped to post this earlier but my internet went out. I know, it happens to everyone and it’s not a big deal. Oh, wait…that’s not internet. Since it’s later than I intended I’ll just post a few quick teasers from MOMENT OF TRUTH. 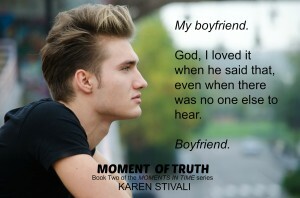 Please remember, if you haven’t read this series yet, it’s best to start with Book One, MOMENT OF IMPACT, as Collin and Tanner’s journey through young love is told as three separate stories that take place at different phases of their lives. You can grab Book One for only 99 cents until March 7 (sale price available at Amazon, B&N, ARe or right here on Dreamspinner). And for those of you who’ve read both books, don’t worry, there’s not too long to wait for Book Three. MOMENT OF CLARITY will release the first week in May (and the same day a paperback collection of all three books will also be available)! If you follow me on Twitter or Facebook you’ll be the first to see my cover reveal in a few weeks (and since I got a peek at it this week I can tell you if you like the first two covers, you’re gonna like this one!). Without further delay, here are a few snippets…. If you didn’t win a prize today (or even if you did) please consider stopping by to chat with me on Saturday (March 7) when I takeover the Dreamspinner Facebook account from noon-2pm EST. There will be more giveaways and maybe an excerpt or two! And please consider attending a multi-author event I’m hosting on Facebook on March 18 with a group of my m/m author friends! Lots of giveaways and other fun to be had! (If Facebook won’t let you join, sent me a PM and I’ll invite you!) Click HERE for link. Thanks again for joining me for my release party! Don’t forget to check the comment section of the previous posts to see if you had a winning comment! Looking forward to the next release so I can come chat with all of you again. In the meantime maybe I’ll see you on Facebook or Twitter! The release party posts and chat were fun. Thanks for the contest and book!